A young eco-sista who see's no reason not to be eco-friendly. How long have you been eco-friendly? Well if you ask my mother, I've been a "hippie tree hugger", as she likes to call it, since i was a child. Even at a young age, I could never understand why we would want to cut down so many beautiful trees, throw trash on the ground, or wonder why we still used gas to power cars because in my mind, the "smoke" from cars made the world smell bad. I would wonder, if humans are so smart, why can't we use technology to find alternatives instead of burning down the homes of helpless animals for our own benifit. It wasn't until I was in high school that I really made the choice to be healthier and live a healthier life style. My goal was to be a professional dancer but I refused to be stick thin, so I choose to be healthy, fit, and athleticly built instead. I started to rub off on my mom and sister who now like organic foods, which I was really into in high school, still am. Now that I'm in college, my mom, sister and I have taken it one step further by letting our hair go natural. Why did you choose to be eco-friendly? Because I don't see a reason not to. I'm afraid that one day, our renewable resources will no longer be renewable. It's saddening to think about how much of the worlds resources we use everyday and if we didn't recycle, use alternative transporation, or use organic products, think about how polluted the world or even our bodies would be!! That's scary to me. I want to live a long healthy life and help my future children lead a long healthy life in a world that doesn't smell like garbage when you walk outside. What do you like about it? That "feel good" feeling. It sounds silly but when I choose a fruit parfait and apples with caramel over a hot dog with chilli and cheese from a cafeteria stand, I feel good about myself. Or when I recylce all my left over water bottles from dance classes I've had all week, I feel good about it. Did you face any challenges? If so, what was/is the biggest obstacle(s)? The challenge is staying eco-friendly when so many people around you are not. It's not so bad now because more of my friends have opened up to the idea of natural foods and products as well as making sure they recycle and carpool as often as they can. But my freshman and sophmore year of college, everything was about parties, fast food, the fast life, and such. Now that I'm in my senior year of college, I think about what goes in my body and how it effects me. Also as a college student, I think about how to be eco-friendly on a budget, which is also hard, but do able. I'm forever going throught old notebooks in storage bins that I have and tearing out paper that was written on, recycling it, an then reusing the notebooks for my classes. Any tips/advice for someone looking to be more eco-friendly?You don't have to be a "hippie" to be eco-friendly, even though I love me some hippie tree huggin people. Also don't think about it too much, You don't have to go out in the community and round up people to go through trash and recycle, even though it would be nice haha. Just do it yourself and others might follow in your footsteps, every little bit counts. Going green can be complex. This discourages a lot of people. There’s really no “right” way it’s basically trying to do something than nothing at all. I sometimes feel like a green hypocrite. Do you feel that way sometimes? Hmm... I do agree, there is no "right" way, and going green isn't really doing anything big, or as you said "trying to do something than nothing at all". But I don't feel like a hypocrite. I think of it globally, whatever you do, however you go green, it all adds up in the end. You know I gotta ask, How long have you been natural and how do you keep it so FLY? 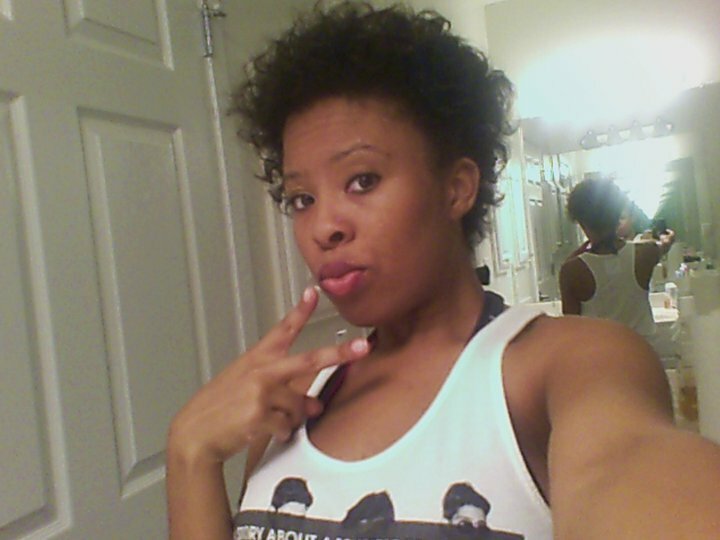 I've only been natural for about 8 months now and its all been trial, error, and lots of prayer haha. For so long, I've tried to get the long flowing, almost weave like, type hair when it just hit me, why?!? I don't even like the type of women whom I meet, who rocks the long wavy hair, and most of the time, it's not their hair!!! Now I just allow my hair to do what it wants, If it wants to curl up, then I say okay, lets just pin it up to the side and let it curl up, or braid it and have a curly mohawk. I don't brush it or straighten it unless incredibly necessary. I shampoo once a week because I sweat alot due to dancing. I used Herbal Essence Hello Hydration Shampoo and Condition (yes, I know, the sulfates, but I cleans out all the salt in my hair so it doesn't dry my hair out). Then I add Organix Coconut Anti-breakage serum (love it!!) and African Pride Herbal Oil. On days I don't feel like washing my hair or don't have time, I just spray my hair with a water, shea butter, and olive oil mix and then use Garnier Sleek and Shine leave-in to tame the frizz, then style with Eco Gel Olive Oil. Is there anything you like to add? Community is key. Without curlynikki.com and naturallycurly.com, I know I would have permed or texturized out of frustration already. Everyone needs some encouragement , whether your going natural, becoming a vegetarian or vegan, or just making the choice to be more eco-friendly. Find an online-home or something in your area to help you because it really is a lifestyle change.